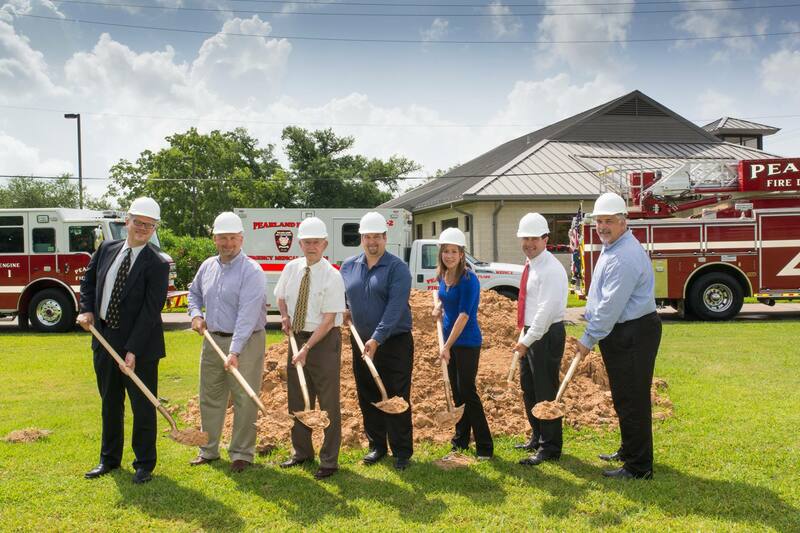 Last week, Ray Holliday and Lisa Andel from our College Station studio participated in the ground breaking for Pearland Fire Station No. 3 alongside: the General Contractor, Crain Group; Pearland Mayor, Tom Reid; and City Manager, Clay Pearson. Construction has commenced on the new 10,726 square foot station which is located on the corner of Yost Blvd. and Broadway St. adjacent to the existing EMS station. The new station will accommodate both Fire and EMS as the department transitions from volunteer to a career fire department and the two emergency entities have now merged. The existing EMS station that is currently located in a converted house on the same site as the new station will remain functional throughout construction. The new Fire Station #3 will accommodate 10 full-time fire fighters and is expected to be open and operational by April 2015, after which the existing EMS station will be demolished. 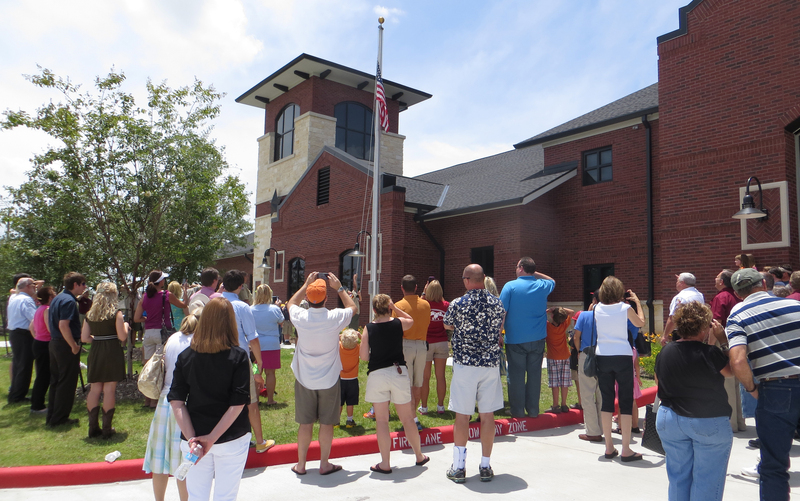 The Willowfork Fire Department recently welcomed its newest station in Cinco Ranch with the opening of Willowfork Fire Station No. 2. 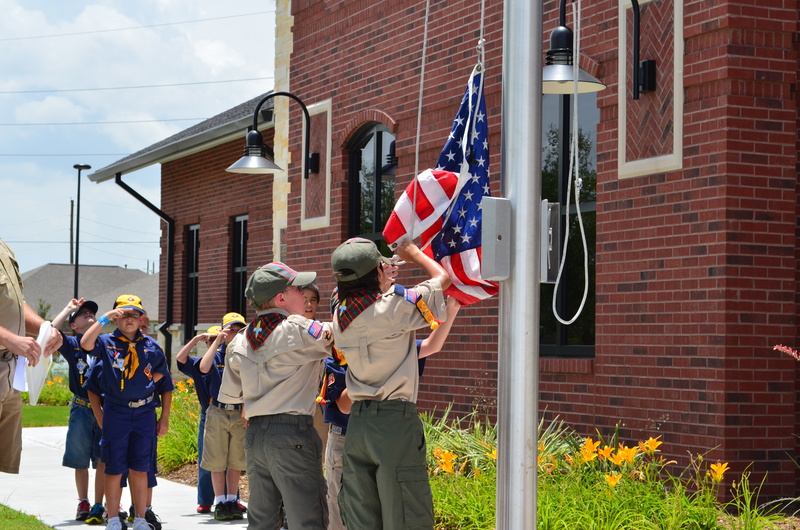 Grand Opening festivities were held Sunday, June 23, and included an open house, activities for kids, refreshments and a presentation of colors by Boy Scout Troop 548. Designed by Ray Holliday, AIA, Lisa Andel and Nicole Story of BRW Architects, this station is more than 13,000 sq. ft. and includes three 65 ft. pull-through bays, living quarters, a full kitchen and a classic red brick structure featuring an illuminated Texas star. 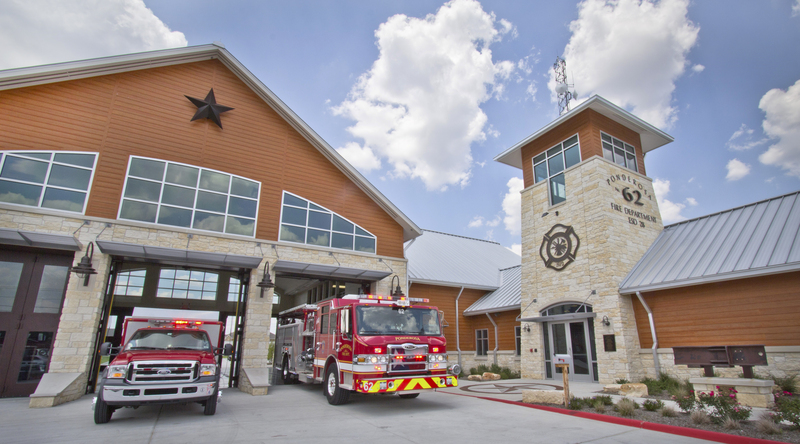 The Willowfork Fire Department is operated by the Fort Bend County Emergency Service District No. 2. BRW’s Ponderosa Fire Station No. 62 has a cameo appearance in the current issue of NZB magazine. 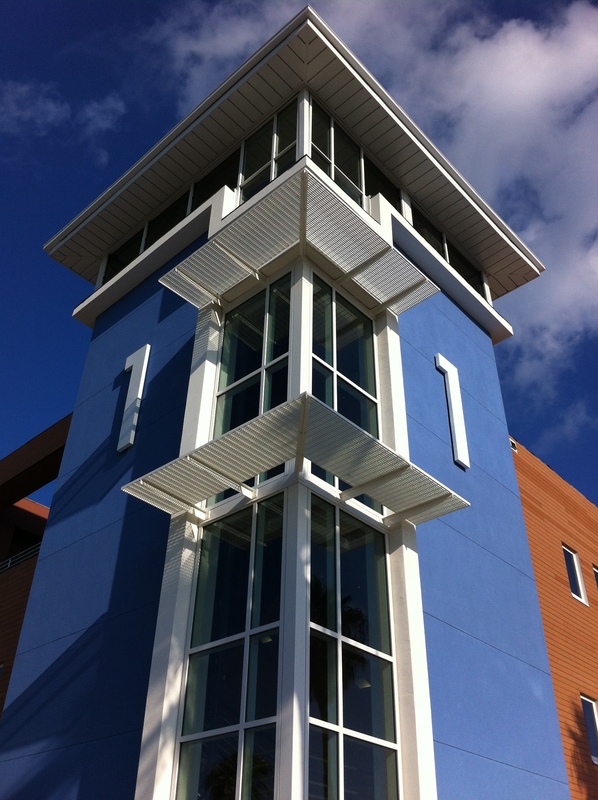 Click here to read about the Fiber Cement siding that is used on its exterior. Please check out two new fire stations just posted on the BRW website! Miguel Roldán, of Roldán+Berengué, Arqts, is the director of the Barcelona Architecture Center in Barcelona, Spain as well as a graduate level visiting professor who taught at Texas A&M University College of Architecture this spring. 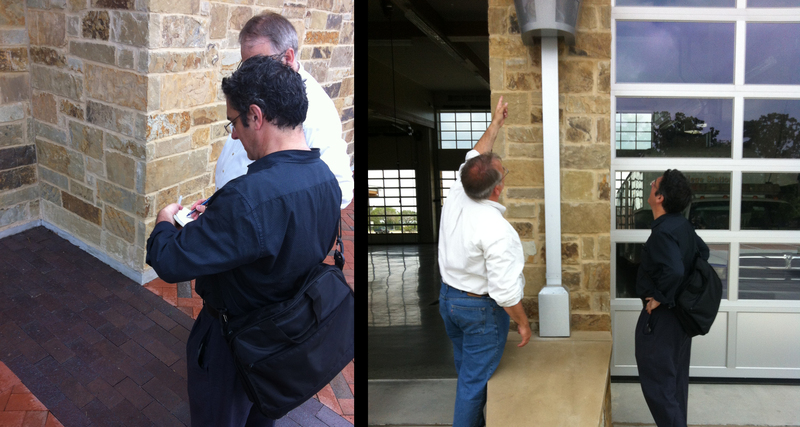 Intrigued by the differences between American and European architecture, he recently visited College Station’s newly constructed Fire Station No. 6. Before his departure in May, BRW Studio Director, Ray Holliday took him on a detailed tour of the 25,000 square foot station. Miguel was impressed by the intricate detail and “American” design. The Station’s striking appearance, the overall intent of the fire house and the size of the fire trucks all made for an enjoyable experience. After the tour the two architects talked about their differing design strategies and the effect of culture on their practice. 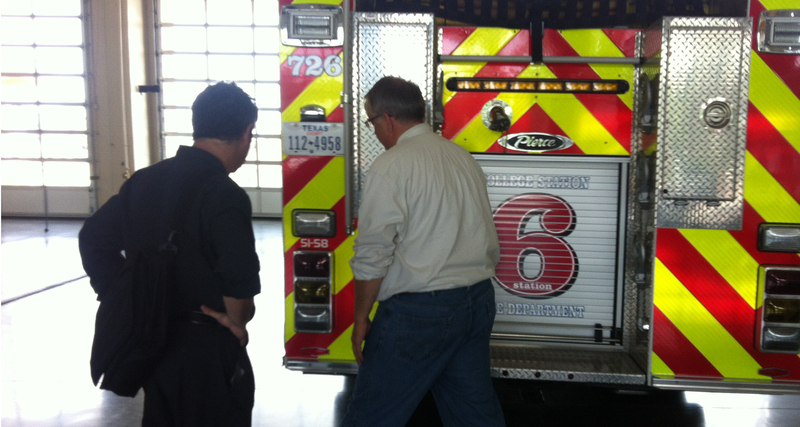 Olé Decor magazine recently published an article about South Padre IslandFire Station 1. Click here and turn to page 37 to read about the Station and it’s Design. 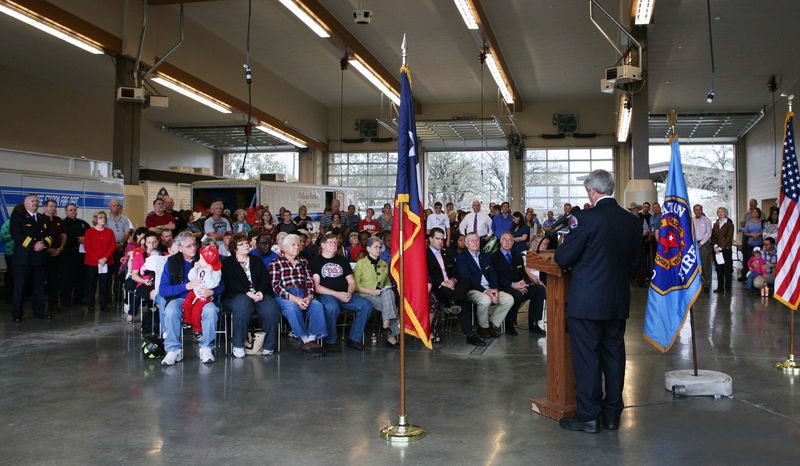 BRW and the City of College Station celebrated the grand opening of Fire Station No. 6. It’s not every day that we design a project in our own backyard, so you can imagine the excitement and pride we have had seeing this project come to life. The City of College Station likes to “do it up right;” so the ceremony appropriately opened with a performance by the College Station Fire Department’s Pipes and Drums. 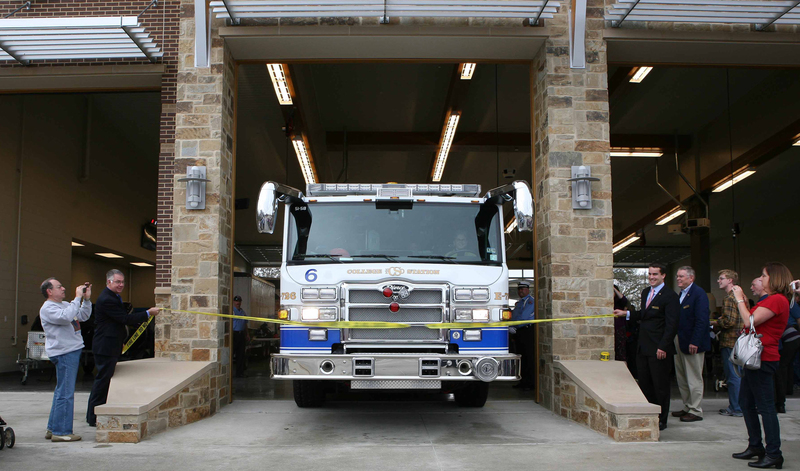 Instead of the standard ribbon-cutting ceremony, Mayor Nancy Berry responded to the “first call” and officially opened the building by sliding down the new fire pole and driving the fire engine straight through the ribbon. The festivities then continued as the station’s personnel broke in their new kitchen and BBQ grill by cooking enough hot dogs and hamburgers for the entire community. 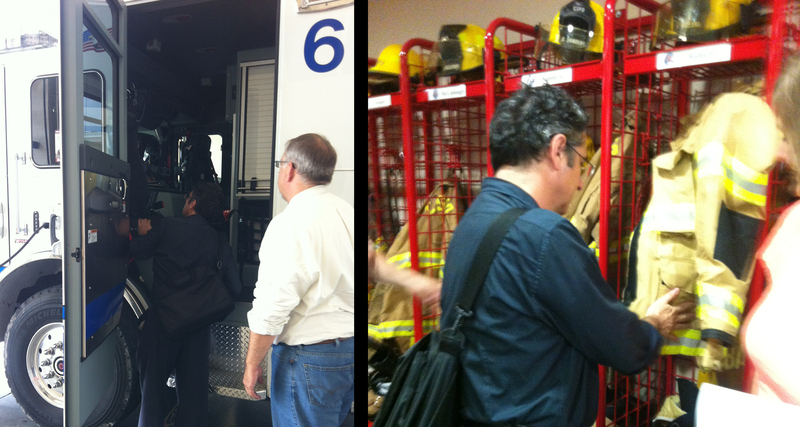 There is nothing like testing the equipment and their cooking skills the first day on the job. Station No. 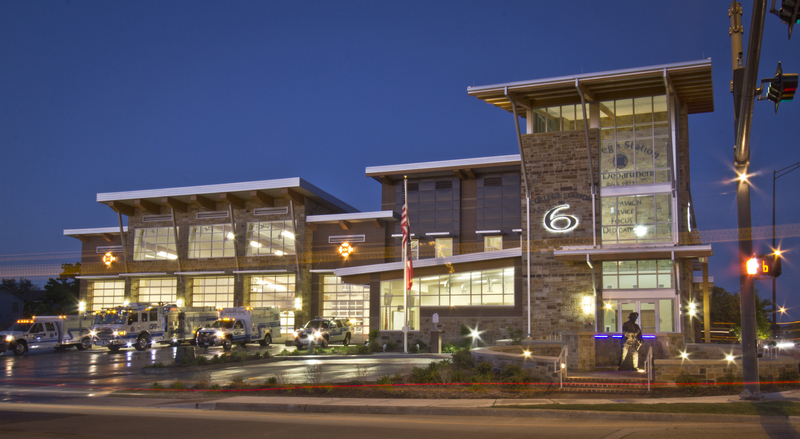 6 is one of BRW’s largest fire stations to date. 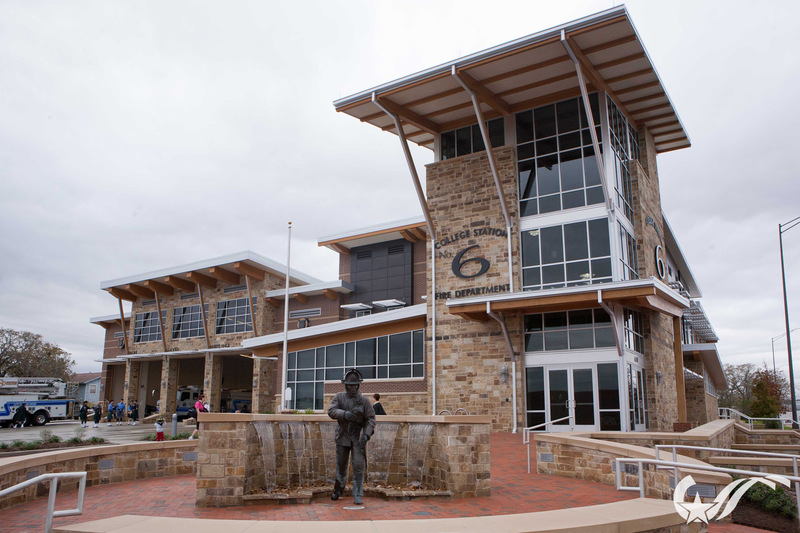 Situated in the heart of Bryan/College Station, the new station will serve the University Drive corridor as well as the Texas A&M University campus. The facility’s modern look was designed to fit within the surrounding commercial district while embracing the strict design criteria of the city. Because the site was so restrictive, the large station sits very close to one of the most heavily trafficked roads in Bryan/College Station. To help create a buffer in the small setback, BRW incorporated a “time line plaza,” water feature, and landscaping to soften the buildings presence at a pedestrian level. A timeline of the department’s history was created by engraving the bricks of the plaza with the names of all past employees and volunteers. 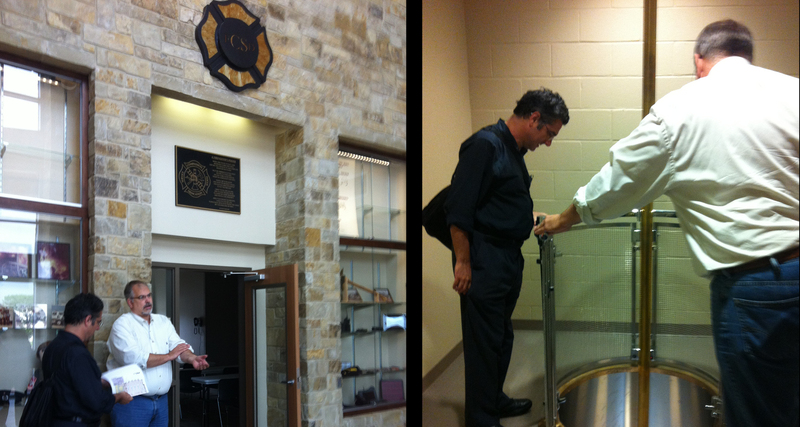 Just inside the reminiscent hose tower, the station features a historical memorabilia area and a multi-purpose room which is most commonly used for departmental training, but it is also available for use by the community. The remainder of the first floor consists of: a report writing room that doubles as a backup 9-1-1 emergency dispatch center, administrative offices, a 14-person dayroom, a kitchen we would all want to have in our own home, a dining room, and weight room facilities. Five 100 foot deep bays house the Fire apparatus, a Hazmat truck and trailer, EMS Vehicles, and water rescue units. The bays are flanked on each side by support spaces such as a decontamination room, Hazmat and EMS storage, and a Bunker room. The second floor is primarily reserved for the private spaces of the fire personnel which include individual sleeping rooms, unisex bathrooms, a laundry room, and a study room that overlooks the apparatus bay. The station is equipped with a state-of-the-art, customizable, alerting system that can be clearly heard throughout the facility. The system has features such as a timer that helps further motivate quick response time, coded LED lights to assist each crew with identifying their specific calls, and individual controls in each bedroom so that staff members will only be awakened when their crew is called. Last, but not least, no fire station would be complete without a fire pole, so this large station appropriately has two. As always, designing and constructing fire stations is an exciting process, filled with opportunities to grow and learn with each new project. This project’s dynamic and cooperative team of architects, contractors, and clients worked well together to tackle issues as they arose resulting in an overall pleasurable experience. Together, the project team made sure that the facility was not only finished on time, but also of the highest construction quality. As exciting as it is to see this project complete, it is a little bitter sweet to say so-long to something that has consumed so many of my thoughts for the past several months. Luckily for me, when I’m feeling nostalgic, all I have to do is simply drive by on my way home from work. All photos courtesy of the City of College Station: To see more click here.